"We're taking on Fine Mist - write that down." There is a place were acerbic meets precious, and there lives baroque string-shredding locals Aunts & Uncles. Made up of SSRIs’ Joseph Hirabayashi, Adrienne LaBelle (formerly of Barcelona Chair) and Daniel Ruiz (formerly of Like Animals Again), the trio’s eponymous debut EP plays like a soundtrack to an Elizabethan dance filled with tweeking courtiers. In general, the release showcases guitarist Hirabayashi’s appealingly caustic vocals, LaBelle’s plaintive violin and percussionist Ruiz’s sweetly aggressive skins, not to mention his glockenspiel. Closing track “Yet to Relent,” meanwhile, cleanses the palette—darker than it’s four companion pieces, it features LaBelle on the mic and belies listener expectations with its humble ukulele. Discorder caught up with LaBelle and Ruiz over brunch at Rhizome to talk about about the EP, touring and how they view the Vancouver music scene. 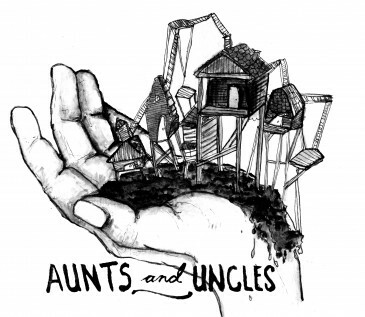 Discorder: What does this EP say about Aunts & Uncles? Adrienne LaBelle: Yeah, this is the “Side A” of what we were going to release as a full 11-song album. We’ve gone through a bunch of phases. It was supposed to be an acoustic band, or have the capability of doing so. [Daniel’s] kick drum used to be an empty suitcase, so we could get to gigs on the bus. We could be able to just play wherever and that’s totally changed a lot. It’s not that we couldn’t still do it, but we’d have to rearrange thing ’cause we’ve written our songs differently. Discorder: You guys just got off a grueling tour. Any standout nights? DR: This guy approached me [after a show at Wunderbar in Edmonton] and [said], “Monday night we have a noise night, wanna play it?” And I was like, “yeah!” Adrienne playing noise? She can do it, Joe can do it, I can do it. Sign us in…[It was at a] super rad venue [Bohemia], super cool people. AL: I had just bought a delay pedal the day before, so that came in handy for the noise set. I used to do Fake Jazz Wednesdays when I was in [the Barcelona Chair] and did the Cobalt Fake Jazz noise set, so I’m getting back to my roots, my public performance roots. … It was fun and we’d never really done that before as a group—maybe you’ll hear more wacky noise experiments from us. Discorder: Awesome. And maybe some dance music? There’s a dearth right now in Vancouver. AL: There’s Fine Mist. We’re taking on Fine Mist—write that down. Discorder: You could do a battle of the bands. AL: We’d go on as Dance & Uncles. There’s one song [of ours]…it has a straight ahead beat and it could turn into a dance, so every now and then Daniel starts playing on the high hat like it’s a dance mix. Discorder: What’s a fun dance pun for Uncles? Discorder: Do you have some take on what a “Vancouver band” is? When you go outside Vancouver or Canada, what discerns us? DR: Vancouver has a really broad spectrum. 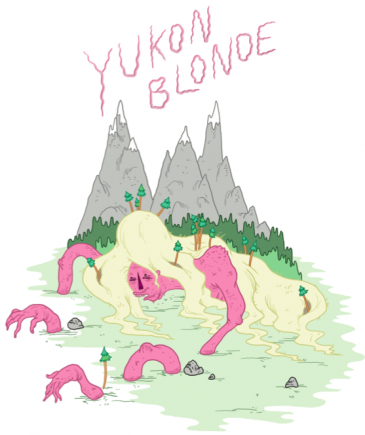 It’s really hard to pick and point what Vancouver bands sound like because there are so many different styles. AL: It’s less of a sound than an ethic. Most of the bands that we know and play with put things out themselves and put together shows themselves and promote themselves. Like, Safe Amp: [Ryan McCormick] started a non-profit to try and [create] venues because we have so many venues shutting down that we have to do it ourselves. We’re trying to play music, and it’s like…venues are shutting down left and right and we’re trying to work it out any way we can. Discorder: I was at your 2009 CiTR SHiNDiG show, and now listening to the album you can tell there has been progression in your sound and presence. Is that something you’ve been working on, or has it come naturally? DR: Well, both actually. When we go to rehearsal, we have a really good practice method. We’ll practice one segment and make sure it’s something we are all comfortable with, and try to add more detail to it. But at the same time, things just come naturally. We have the idea for a section of song, but [Adrienne will] say “Can I just do this because it’s easier?” and we’ll be, like, “Cool. Yeah, do that.” Then Adrienne can sing something over top. Discorder: Besides more recording, what else is coming up for you guys? DR: We’re planning a tour in early November, also Western Canada. Maybe another week-long tour. We did three live songs [for local music blog] Tasty Ears; we did three tunes and an interview with them. That should be coming out soon. We were actually thinking about doing a show with Bleating Hearts and Wintermitts. 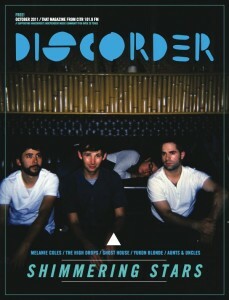 Discorder: You’ve shared the stage with some amazing bands, from locals Dan Mangan and Ladyhawk to Denmark’s Efterklang. What bands are on your wishlist? DR: Owen Pallett; He is an inspiration to me. I was listening to him one night and this one riff, I was like, “I gotta do something like that.” It’s there, the orchestration. AL: I’m small scale. I could say David Bowie or something crazy, but that would be weird. It sounds cheesy but I like the journey. All of a sudden we were playing with Efterklang, this band from Denmark. I’d heard of them but I hadn’t listened to them and I really liked them. Same thing with [Montreal’s] the Luyas. I don’t have dream shows, I like the shows that come together and are amazing and you feel warm and fuzzy. I guess it would be a great time to play with some big band who I have all their albums of, but I’m way more stoked on doing great tiny things in tiny pockets.